France claim that defending his championship is not enough reason for Wellington Jighere to be in France. 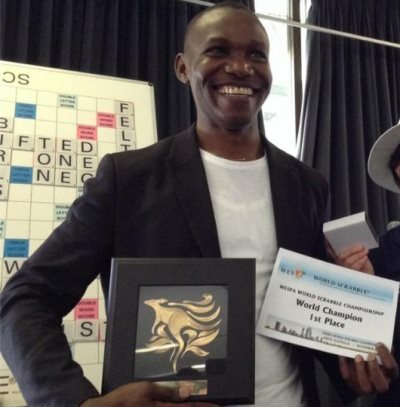 AFRICANGLOBE – The French embassy in Nigeria reportedly denied the reigning World Scrabble Champion Wellington Jighere a travel visa to the World Championship at the Grand Palais in Lille, France. On Friday, Jighere took to his Facebook page to announce that he — as well as the rest of Nigerian scrabble team — had been denied French visas even after they had fulfilled all necessary visa requirements. Jighere became the World Scrabble Champion in November 2015, after he defeated Britain’s Lewis Mackay in four straight rounds out of seven in the finals of the World Scrabble Championship in Australia. At 32 years old, Jighere’s victory made him the first African to be crowned the World Scrabble Champion since the competition began in 1991. Indeed, only two other winners from the English-Language Scrabble playing countries have emerged outside of the U.K., the United States, Canada, Australia, and New Zealand. At the tournament in Australia, Nigeria was considered one of the best teams as four out of its five players ranked in the tournament’s top 50 list. Jighere’s visa denial was met with widespread condemnation in Nigeria, and a few wondered if it was not a case of an underhanded maneuver from the French to deny Jighere a chance to defend his title. An official of the Nigerian Scrabble federation, Sulaiman Garba Gora, lamented the fact that only one member of the Nigerian team had been issued a visa and revealed that a visa that typically takes about 10 days to issue actually dragged on for more than six weeks with no tangible results. However, an intervention from Mind Sports International (MSI) – Organisers of the World Scrabble Championship in conjunction with the French Scrabble Federation may save the day. Bellanaija reports that the 2016 World Scrabble Event Director Ganesh Asirvatham said, “MSI in conjunction with the French Federation provided the necessary supporting document to ensure that the visa application process would be smooth and trouble free. Even now, officials from the French Federation are making last minute appeals to French embassy in Nigeria. The competition is scheduled to begin on Wednesday, August 31, in France.